2018 is the 200th anniversary of the publication of Frankenstein, or The Modern Prometheus by Mary Shelley. She lived in Dundee as a teenager, which partly inspired her in writing the novel. This was recounted in 2015’s Frankenstein Begins comic. The sequel, to be published in October 2018, is entitled Frankenstein Returns. University of Dundee’s Comics Creative Space and the Being Human Festival will team-up to celebrate Shelley’s novel, and its afterlife and legacy. There will be a series of events in Dundee, including talks, workshops, an exhibition, the publication of a Dundee edition of the book, and the launch of the new comic. 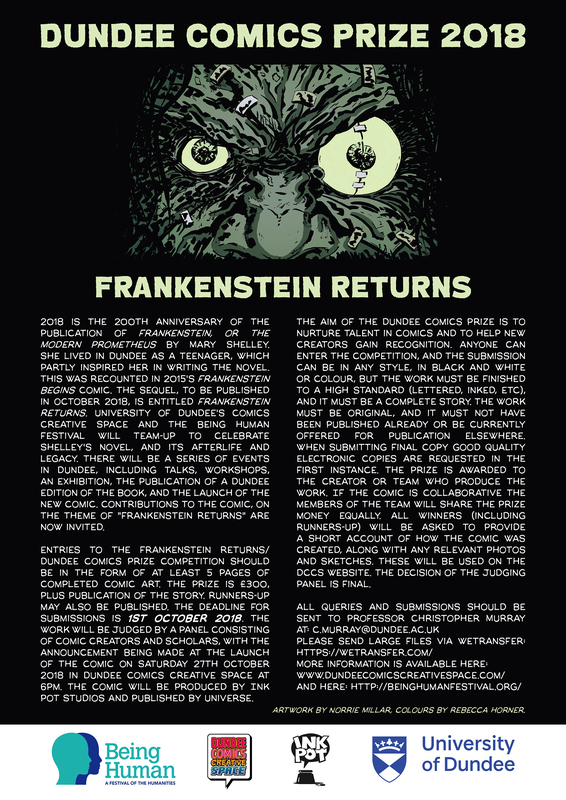 Contributions to the comic, on the theme of “Frankenstein Returns” are now invited. Entries to the Frankenstein Returns/Dundee Comics Prize competition should be in the form of at least 5 pages of completed comic art. The prize is £300, plus publication of the story. Runners-up may also be published. The deadline for submissions is 1st October 2018. Posted on July 6, 2018 July 6, 2018 by dundeecomicscsPosted in comics, competitionTagged being human, comics, dundee, dundee comics prize, frankenstein, mary shelley, prize. Swift at 350 – comic launch! Come along on Saturday to find out the winners of this year’s Dundee Comics Prize! We are delighted to invite you the launch of Swift at 350, a comic that responds to the work of the world’s greatest satirist. The event takes place this Saturday (25th November), and promises to be a lot of fun! Part of the Being Human Festival of the Arts 2017, the occasion is inspired by Jonathan Swift’s satirical novel, Gulliver’s Travels. Professor Chris Murray will give a brief overview of some of the wonderful adaptations of Swift’s work in comics, and the winner of the Dundee Comics Prize will be announced. The creators of the stories that appear in Swift at 350 will discuss their contribution, and every attendee will be able to pick up a free copy of the comic. Come meet the creators and learn more about the process of bringing ideas to life in the comics form. There will also be a wine reception. Tickets are free, and can be booked through this link. Follow the Dundee hub of the Being Human Festival on Twitter @HumanDundee and on Facebook for the latest updates. In addition to University and local news outlets, we recently featured on a special edition about Gulliver’s Travels for Free Thinking on BBC Radio 3. Please share this event with anyone who may be interested, and bring along friends and family on the day. Posted on November 23, 2017 by dundeecomicscsPosted in competition, EventsTagged being human, comics, dundee, dundee comics prize, gullivers travels, jonathan Swift, launch, satire. DCCS will be at Dundee Science Centre tomorrow running comics workshops during the Gulliver’s Worlds day of events (part of the Dundee Science Festival and the Being Human festival). There is a full day of events from 10am-5pm. Our artist/facilitators will be there between 10am-noon and 2-4pm. Come along and invent some wonderful creatures and make some comics! Join Gulliver on his journeys through different worlds! Follow the story of ‘Gulliver’s Travels’ as written by Jonathan Swift and take a fresh look at our Environment from different perspectives. What does it feel like from the perspective of a giant, do we realise how small we actually are and what might life look like if it were to exist somewhere else in the universe? Find out all about these different ‘points-of-view’ – both in this world and out! Posted on November 3, 2017 November 3, 2017 by dundeecomicscsPosted in Events, scienceTagged being human, comics, dundee, gullivers travels, jonathan Swift, science, workshops. Come and join us for an H.G. Wells themed comics workshop, and whet your appetite for all things alien before the Martian Autopsy event at the University of Dundee. Drop by to hear a talk on the history of science-fiction comics! See comics works-in-process by creators Norrie Millar and Rebecca Horner from the forthcoming H.G. Wells graphic anthology! Then design your Martian and make your own comic, perhaps showing the destruction they would wreak on Dundee! Posted on November 10, 2016 by dundeecomicscsPosted in Events, workshopsTagged being human, comics, hg wells, invisible man, island of dr moreau, war of the worlds, workshop.